Wow! Diagonales des fous was a tough race! 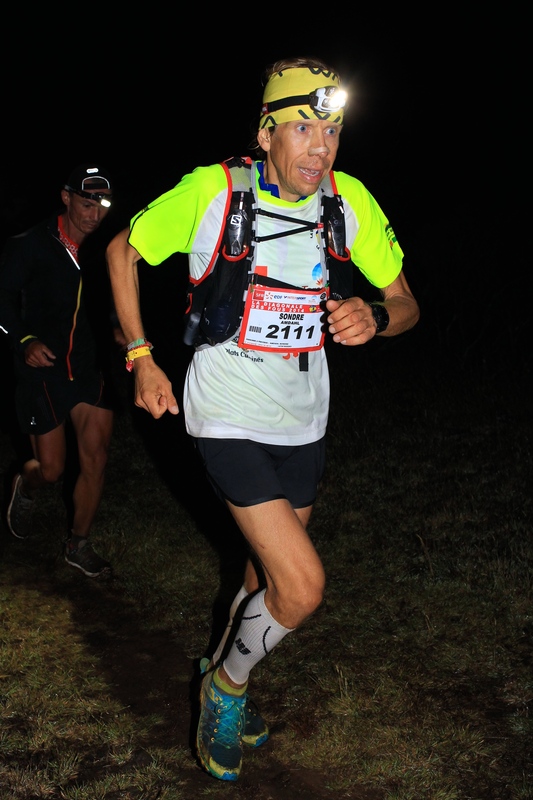 I knew that the course was 173 kilometers long with 10.000 meters of vertical, but I did not know that I would use more than 31 hours to complete this «monster» of a race. I am disappointed with my personal performance, but still happy that I was able to finish the race in a decent way. My original plan for 2014 didn’t actually include Diagonales des fous. 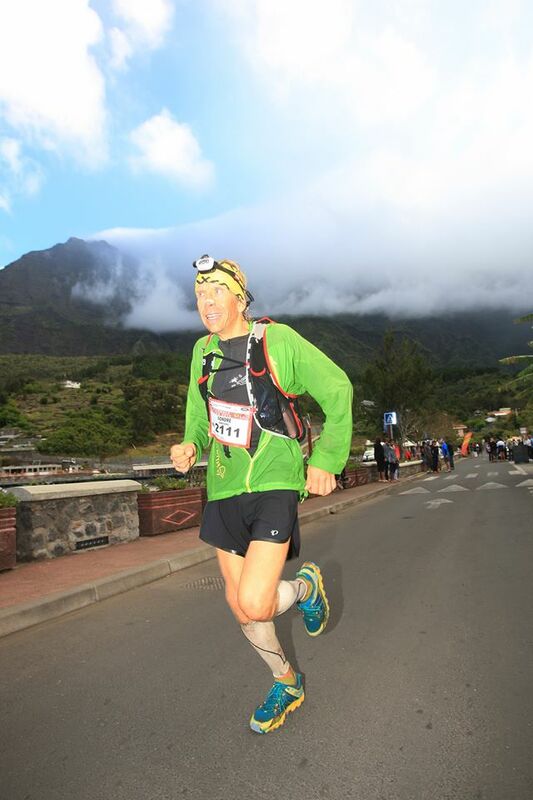 I had planned to race Transgrancanaria, Lavaredo and UTMB to get three races for the Ultra-Trail World Tour (UTWT) general ranking. But I got sick the week before Lavaredo and had to change my race calendar, especially after my 7th place at the UTMB in the beginning of September. 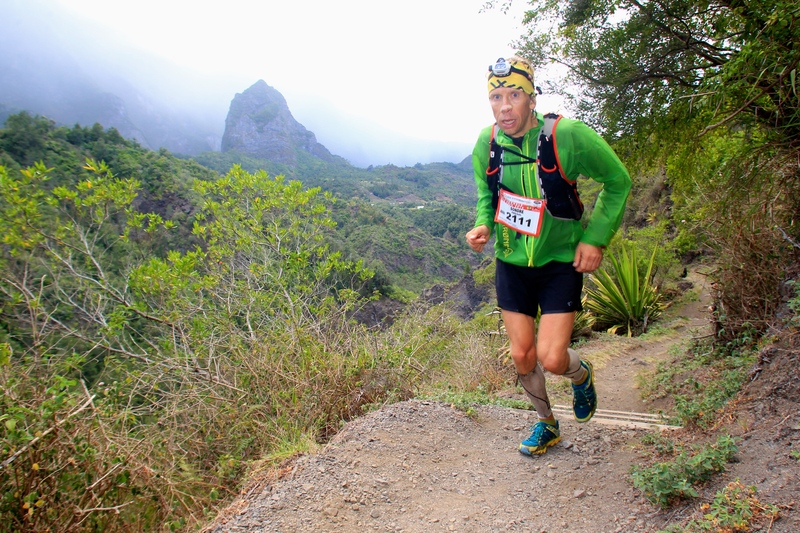 I got some help from the UTWT to get into Diagonales des fous – and here I was at the tropical island of Réunion, ready to race. My race preperation went well, all according to my plan. I took a few days of rest after UTMB, before I slowly buildt up my milage again. I had a good, two weeks of tapering before I flew to Réunion via Madrid and Paris. I spent the last few days before the race in Saint Gilles les Bains og the west side of the island. It did not take me long time to get used to the heat, even tough the air was more humid than on Gran Canaria. Training the last week was easy, just some half hour runs and a short walk along the beach. We (Jason Schlarb, Gediminas Grinius and my self) arrived at the start area in Saint Pierre a good three hours before the gun went off at Thursday night (October 23rd). It was an incredible atmosphere with the tropical, reggie-like music mixed in with the sound from the live TV-broadcast. I got my two drop bags sorted out and slowly worked my way to the start area and the elite zone where we waited the last hour. 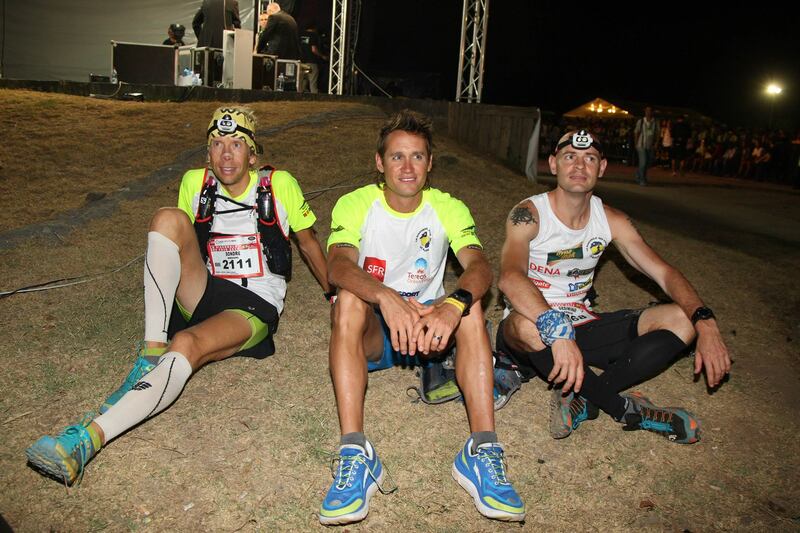 Gediminas, Jason and I waiting at the start. Footage from the start area. I have heard that there was 30.000 people watching the start of the race i Saint Pierre. 5-4-3-2-1-GO! The race set off with an impressive speed up at the front. I logged a couple kilometers with sub 4-speed per kilometer. My plan was to start fast, as I had heard that the trail got very narrow after a few kilometers and that it could be very busy at the second time check. I didn’t have any problem with the speed, but in retrospect I realize that it was unnecessary to start the race this fast. I have talked to many runners who eased off in the beginning, and they had no problems with the course getting narrow. I kept a steady pace for the first couple hours, and enjoyed the nice trails, some dirt road and quite a bit of road running. When we got higher up, the weather turned pretty nasty, with rain and wind. I didn’t mind the weather in the beginning, but after a while I got very, very cold. I think I was borderline hypothermic. I picked up some gels from our local hero, Lukas Garcia, at the aid station at Piton Textor (40km) at 2265 meters. At 50 kilometer I met Lukas again, and he helped me change clothes before I set out into the dark night. Footage from the race (including some shots of me changing clothes at 50km). The trail was more technical after the 50km mark, and the pace dropped off. I tried to increase the pace again, but my legs was not as fresh as I had hoped for. I lost the motovation a bit, and struggeled to keep a fast pace on the very technical downhill into Cilas (65km). I got thru the Cilas aid station in 7th place. After Cilas, I didn’t pass any runner (that I know of), but I was passed by lots of runners that caught up and passed me. On my way to the Cilas aid station. I am normally a strong uphill runner and I very rarely get passed on the uphills. But at this race, other racers passed me on both the uphills and the downhills. This was hard for my moral, but I tried to stay as positive as I could. 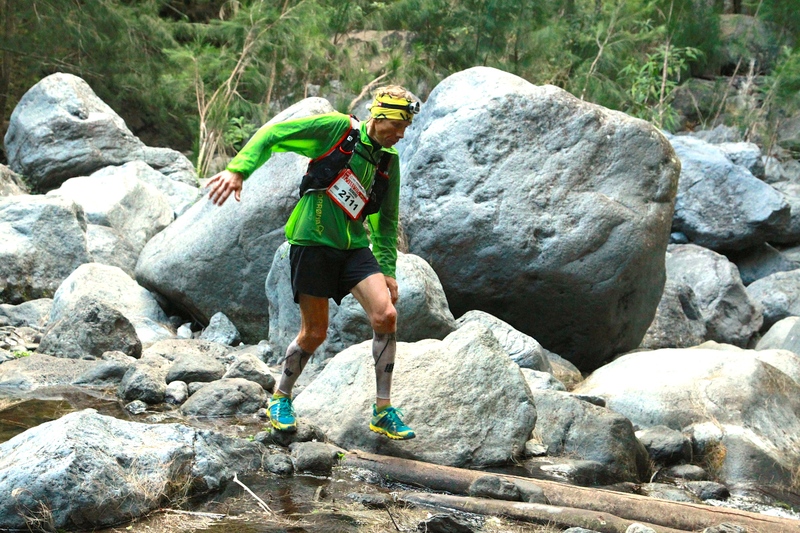 I focused on getting to the next aid station, and realized that I should be happy just to complete this race. I tried to increase my speed several times, but my legs would just not respond. I continued to run in my own slow shuffle-pace. 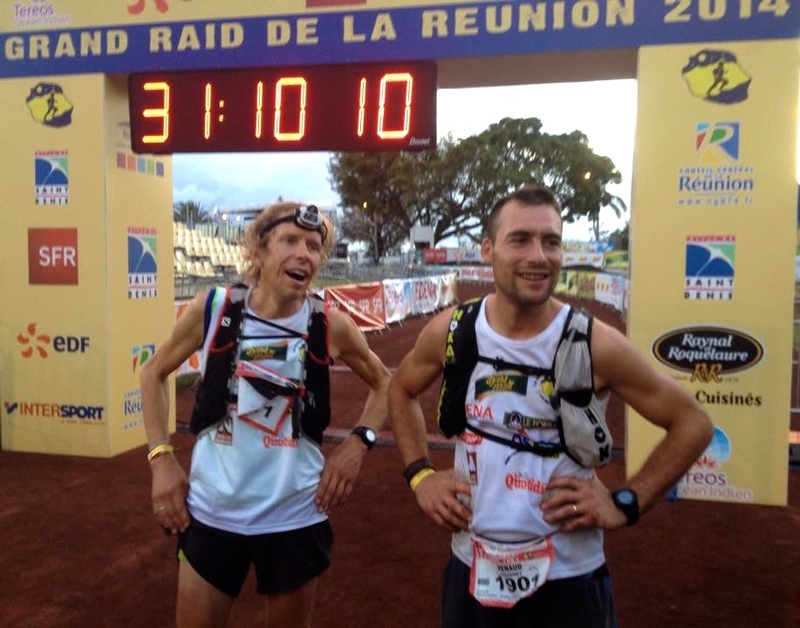 I cought up with Renaud Rouanet from France at the Sans Souci aid station (133 kilometer). Renaud had passed me earlier in the race, but had then met «the wall» and needed a short break to refuel, sleep and do a «restart». 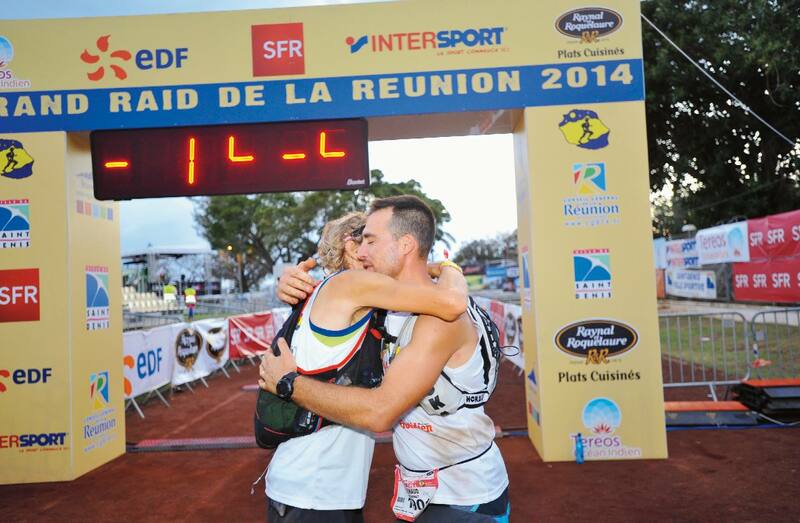 I joined forces with Renaud, and we continued together towards the finish line. Renaud is a very nice guy, and I enjoyed his company. We tried to motivate each other as much as we could – not an easy task as we ran thru the second night without sleep. We walked all the uphills, ran the flat sections and tried as best as we could to run the downhills. 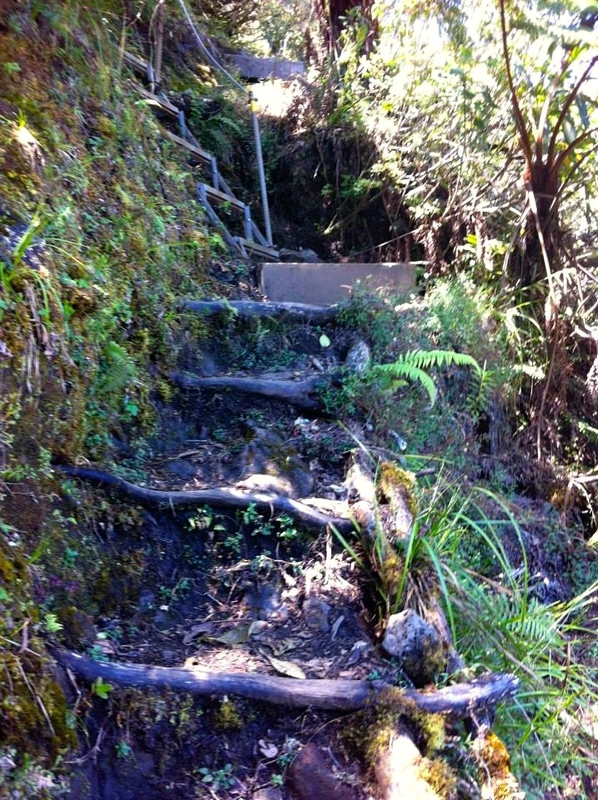 Some downhill sections were so technical and rocky that it was easier to walk than run. We slowly worked our way towards Saint Denis, and as the new day rose, Renaud and I crossed the finish line together after 31 hours and nine minutes. I was so happy to have finished the race! I ended up in 17th place overall and 4th in the V1 category. At the finish! Renaud Rouanet on my right side. Photo: Julian Chorier. Diagonales des fous was to close to the UTMB (it is 7 weeks between the two races). I do not think this is the main reason. I know my body, and felt that I was 100 percent recovered after UTMB. I did Diagonales des fous without a crew. It is a long flight to Réunion, and I could not afford to fly in my normal crew. Therefore, I had to carry with me a lot of gels. I did also miss my sports drink from Tailwind Nutrition as I had to rely on water and coke from the official aid stations. I do think this slowed me down a bit, but is absolutely not an excuse for not running faster. My friends Jason and Gediminas didn’t have a crew either, and they finished 4th and 10th. I had mentally ended my race season. The original plan was to end the 2014 racing season with UTMB and then do Tenerife Bluetrail mostly as training in the middle of October. But things changed, and I got the opportunity to run Diagonales des fous. I do not know how to explain this, but I do think my body was ready for Diagonales des fous, but my mind wasn’t ready for another hard 100-mile race. I did finish one of the toughest 100-mile races in the World. Many of the favorites did not finish. My body is 100 percent injury-free. I got one small blister. That’s it! One small blister in a 100 mile race. My La Sportiva shoes/injinji socks combo worked perfect. I followed my race nutrition plan to 100 percent, without any stomach issues. And the best thing about the Diagonales des fous is that I got three results for the UTWT general ranking. I ended up 6th, a result that I am extremely proud of! Ultra Trail World Tour ranking. La Sportiva Helios shoes. These worked well, but for a race like Diagonales des fous, I think I need a bit more rugged shoe. There is not enough protection for my toes. I kicked roots/rocks many times, and that hurt! Injinji Trail 2.0 socks. Worked perfect. Just one small blister. Pearl Izumi shorts and a liner. I love these Pearl Izumi shorts, but I got some chefeage at UTMB, so this time I used a thin liner as well. Jacket from Norrøna. This jacket worked OK, but I wish I had my North Face jacket (the same as I used at UTMB). 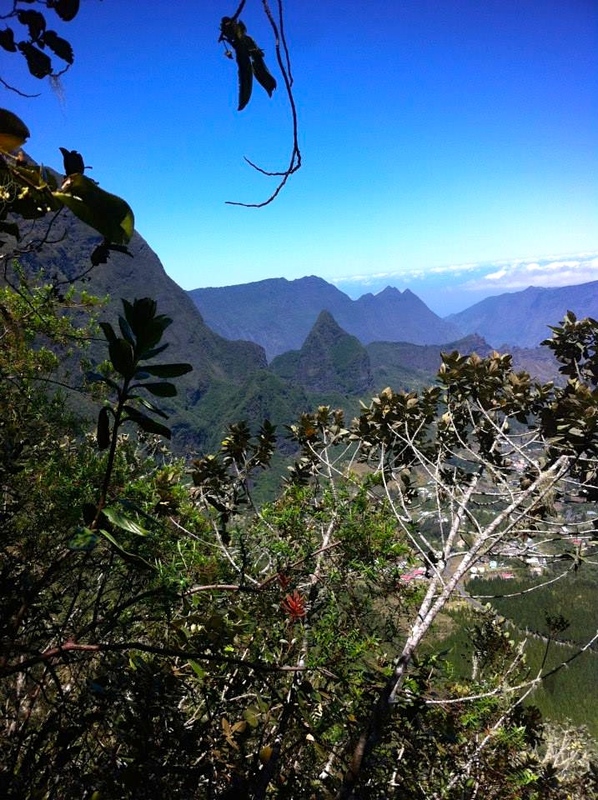 I had worse weather at Réunion than at UTMB this year. Petzl Nao headlamp. 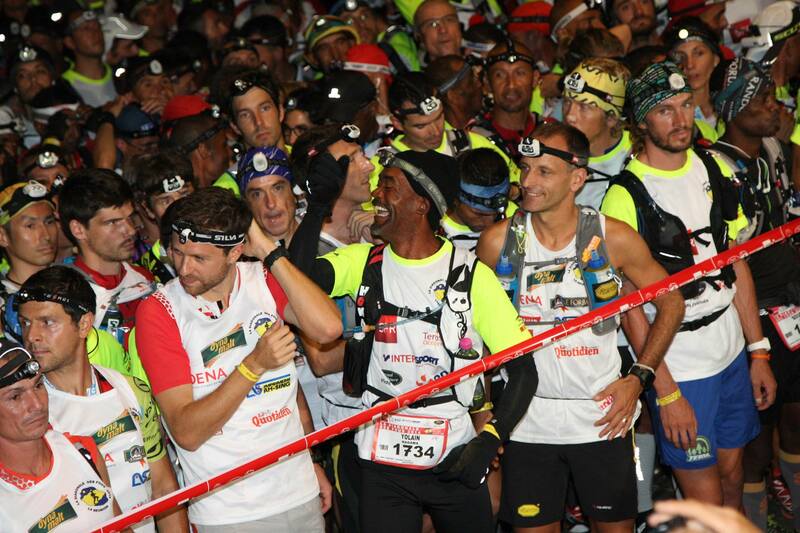 Very good headlamp that I trust on these long races. Had two extra batteries, but I only used one of them. Gels from GU and Cliff every 30. minutes. Tailwind drink for the first hour and after my drop bags. Water and Coke at the aid stations. Some potato chips, bananas and soup. PS: The race organizers forces all the runners to use their logo-shirts in the first and last part of the race. That’s the reason why I wear some unusual clothes in some of the photos. I have edited a short piece from the race. The trail is very, very technical in some places. Photo: run-decouverte.